Have you ever been in a situation where things go wrong – really wrong – and nobody is prepared to step up and take total ownership of the situation? Sometimes the leader will deflect on to their subordinates, blame the equipment or the systems, or even just deny that they have had any part in the situation because they weren’t there on the day. Sometimes the people involved in the situation blame the leader for inadequate training, unclear instructions or improper supervision. It comes down to everyone passing the buck and a whole lot of finger pointing. The concept of Extreme Ownership was developed by Jocko Willink and Leif Babin in their book Extreme Ownership: How U.S. Navy SEALs Lead and Win. Willink and Babin were both officers in Navy SEAL Task Unit Bruiser. These guys fought through the worst days of the battle of Ramadi in Iraq. The knowledge they acquired on the ground has now become part of the training for incoming SEALs. Willink starts the book with a powerful, yet bleak story – an incident that went disastrously wrong. When it was all over, a SEAL was injured, an Iraqi ally was dead, and many others were placed in serious danger. The thing about this story is the whole thing could have been avoided. Multiple breakdowns in systems and protocols added up to one big disaster. In aviation we call that the “Swiss Cheese Effect”. It’s when all the holes line up which allows the accident or incident to happen. Straight after the event the Navy wanted an investigation. Willink, who was in charge, collected all the relevant information. He found mistakes at all levels, but he didn’t feel right about submitting the list without adding one crucial detail. “I had to take complete ownership of what went wrong”, says Willink. “That’s what a leader does, even if it means getting fired”. This is what Willink and Babin call Extreme Ownership. Regardless of whether Willink had a part in each of the breakdowns along the way, he was the leader and was therefore prepared to allow the buck to stop with him. It was not only the right thing to do, it also paid off. By taking the blame, Willink kept the trust of his team and was able to identify ways of improving operations. A different level of communication was possible because of his leadership. If he had thrown someone under the bus he would have lost the trust of his team, making it impossible to lead them. He also would have told his commanders that he couldn’t manage his team. That is a lose-lose situation. So how come most of us don’t follow the principle of Extreme Ownership? It seems like such a positive way forward: it builds trust, promotes open communication, and creates the space for very powerful learnings. Step up, own it, be the leader, and set the example. When I thought about why we don’t embrace Extreme Ownership I came to the conclusion that people don’t like having arrows shot at them and unfortunately our society has gravitated towards a “blame someone else” culture. We are more litigious than ever with the number of lawsuits skyrocketing this century. I have noticed common language patterns around shifting blame and deflecting ownership. Taking responsibility for whatever is under our care now seems to have options. 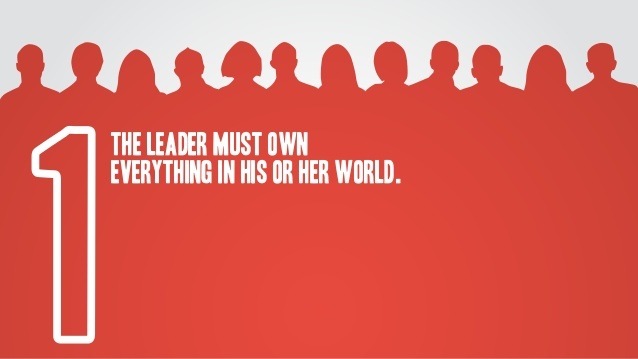 True leaders own everything that happens on their watch and the results of that are phenomenal.